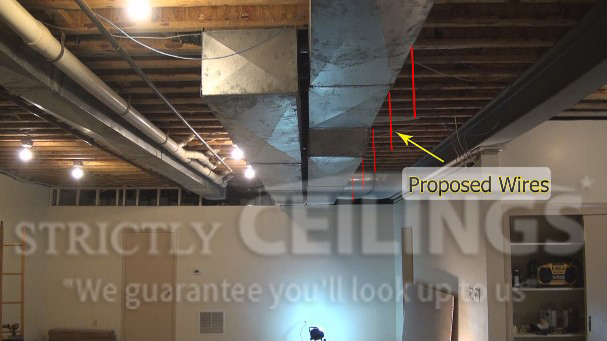 Installing the support wires for a drop ceiling is a very important step in suspended ceiling installation. Drop ceilings are required to carry a significant amount of weight depending upon the ceiling tile and light combination that you choose. Understanding which wire and fastener to use for your project can save you a lot of time on installation. The wires are installed after you have figured your layout and determined your border sizes. 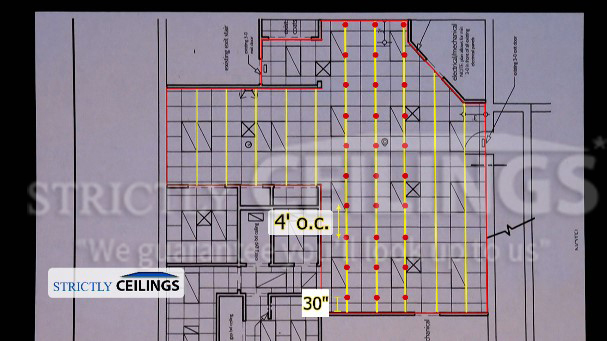 If you don’t know how to layout a drop ceiling…be sure to check out our sections on basic and advanced drop ceiling layout. All metal grid type drop ceilings consist of a main runner, 4’ cross tees and 2’ cross tees. Metal grid systems are by far the strongest and most versatile type ceilings installed anywhere. Vinyl type ceiling grid systems are weak and require many more support wires then metal systems. Main runners are what carry all the weight of the drop ceiling. These metal supports run the entire length of the room and are supported by the drop ceiling wires. The 4’ cross tees are what connect the main runners together and the 2’ cross tees create the 2×2 pattern if desired. Because the 4’ cross tees are connecting the main runners together, the mains and wire rows have to be spaced 4’ apart from each other. Where ever there is a main runner there must be a row of wires. To determine where the first row of wires will be you must know what the layout is. Once the layout is determined you can begin installing the wires. Once you have the layout figured you need to know which wire and fastener combination to use. For residential basements you will most likely use a 3” wood lag. For the wire installation you’ll want to use 2 strands of 18 gauge wire. It’s best to use straight wire that is not coiled as the coiled wire will create a spring in the ceiling. For commercial projects you will install one strand of 12 gauge galvanized wire. These come in 12’ lengths and can be bought at a local building supply house. 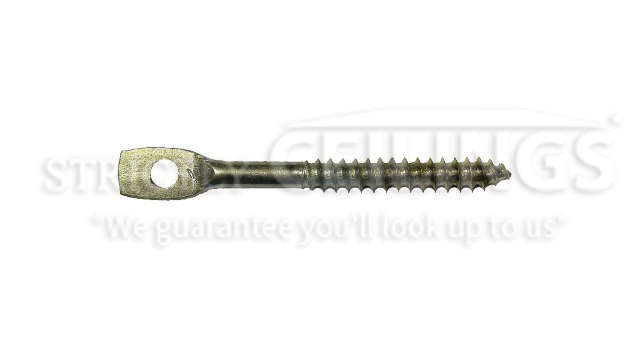 There are several different types of fasteners used for hanging drop ceiling wire depending on the application. For plaster you can use a 4” toggle bolt. For concrete you would use a split pin or wedge anchor. For metal decks or metal joists you would use a 2” self-tapping lag with an eye-let. Once you know where the wires will be installed and know what fastener you’ll be using, you need know what you will be fastening the wire to and how long the wire needs to be. For residential projects, determine what the ceiling height will be and how far from the joist the finished ceiling height is. I recommend at least 4” below the wood joist because you want enough clearance to install the tiles. This will also make removing ceiling tiles easier if some get damaged. On residential basement projects you will most likely have a wood joist system like the picture to the left. You will want to install the fastener into the middle of the joist to give you extra length on the wire. The longer the wire is the easier it is to install the ceiling grid. 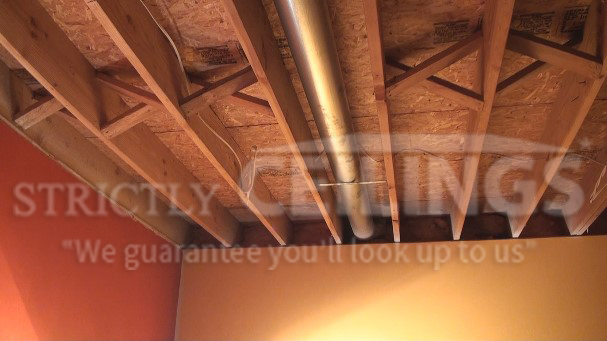 Measure from the center of the joist to the finished height of the ceiling and add 6”. This will give you 3” extra to tie the wire around the fastener and 3” inches below the ceiling height for tying to the main runner. On commercial projects I usually add 1’ at the top and 1’ below the ceiling height. One very important thing to note is that you never want the wire to be too short. If they are too long you can always cut them later when installing the grid. If they are too short you have to rework all the wires and it’ll cost you time. Mark the joist or substrate with a pencil at your pre-determined layout approximately 30” from the beginning of the wall. You can use the following methods for installing each fastener. Wood Joists: Use a 3” wood lag with a cordless drill. You must use a lag adapter on the end of the drill to install the lag. Install the lag half way up the joist in the center. Wood I-Joists: Use a 3” wood lag like above but install the lag into the upper portion of the I-joist that’s up against the floor boards and use the 28” full length 18 gauge strand wire. Plaster: Use a 4” toggle bolt. You will need to drill a 5/8” hole into the plaster, then insert the toggle bolt and tighten the nut up to the washer. A hammer drill is a big help. Once snug, tie the wire to the toggle bolt with at least 2 full wraps. Concrete: Use a wedge anchor with an eyelet or a split pin anchor. You’ll need a hammer drill with a ¼” carbide bit. Drill the hole approximately 1 ½” deep and pound the anchor in until it’s seated. Metal decking or Metal Joists: Use a 2” self-drilling anchor on either a drill with a lag adapter or use an extension pole made by Lag-master to install the fastener from the ground. The extension pole can install the fastener and tie the wire at the same time. Bar Joist: No fastener needed. Simply tie the wire around the bar-joist. For residential projects, tie the support wire around the fastener with at least 2 full wraps using 2 strands of 18 gauge wire. For commercial, tie the support using the 12 gauge galvanized wire or 3 strands of 18 gauge wire. In all cases at least 2 full wraps must be completed. Finally, the most important thing to remember when installing drop ceiling support wires is to Pull Down On The Wire after tying to eliminate any slack that could cause the ceiling to sag in the future. 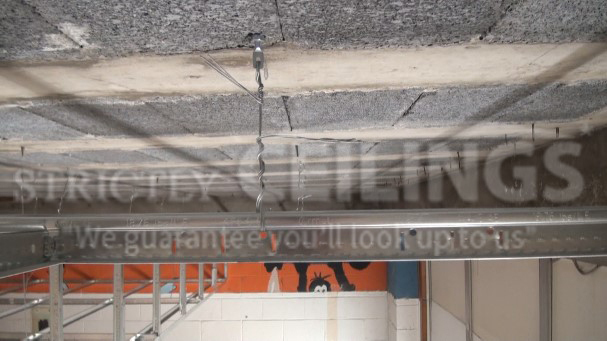 To complete the installation, install the drop ceiling support wires every 4 lineal feet apart down the entire length of the main runner and every 4’ away from each consecutive row. Review the full video if you are having trouble with any of the procedures.